On Wondering Star, we feature very large sensing capabilities. Nature often provides this probing capacity by bombarding us with different particles. Those are generally photons but we are also bombarded by other particles such as Muons. Some outfit use these to detect nuclear materials at the border while others use this given capability to image things we could never image otherwise: Large mountain ranges. The TOMUVOL project proposes the construction and validation of a robust and portable tomography of volcanoes with atmospheric muons. Atmospheric muons are produced at the top of the atmosphere following the collisions of cosmic rays with air.According to their initial energy, they can cross several hundred meters or kilometers of rock before their disintegration. The method therefore uses the high penetrating power of muons with energies above the Tera electron volt (TeV) to probe the depths of volcanic edifices up to tens of kilometers. Information obtained by this technique will help to model the internal structure of volcanoes, which is an essential both for understanding and for the monitoring of buildings assets. 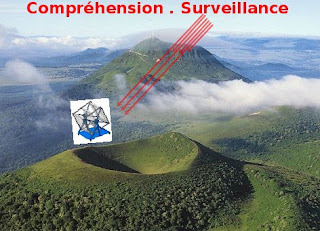 The principle of the method is as follows: a muon detector is placed on a slope of the volcano and recorded continuously in real time the flow of muons passing through the building according to the angle of incidence with the muon local vertical (zenith) and the horizontal (azimuth). The measured flux depends on the flux of atmospheric muons, known elsewhere, and attenuation of muons during their propagation in rock. This attenuation is determined by the geometric path of the muons in the rock, calculable with good accuracy if an accurate model of the external shape of the building there, and the density distribution along this route. Therefore, measurement of the attenuation of the muon flux as a function of zenith and azimuth allows the realization of a precise mapping densitometry of the building. In volcanology, the value of this new method is multiple. It is likely to provide further information to those obtained with more traditional techniques (seismology, gravity, electrical resistivity tomography, electro-magnetism) and with higher spatial resolution. In addition, it is easier to implement because it is remotely installed and does not require extensive travel, often in difficult terrain, to study the volcano. The application, in a second step of this method for monitoring active volcanoes is also one of the main objectives of technological and methodological developments initiated within the framework of this project. It is anticipated the installation on the slopes of active volcanoes identified as priority targets (eg, Stromboli, Piton de la Fournaise, Montserrat ,...) a sensor that sends data through the Internet, to a monitoring center that continuously analyzes to report any change in the internal geometry of the building. It also campaigns for long-term measurements, focused on the study of a building well known, by using multiple muon detectors simultaneously or a single, moved sequentially around the building. Their long range in matter renders high-energy atmospheric muons a unique probe for geophysical explorations, permitting the cartography of density distributions which can reveal spatial and possibly also temporal variations in extended geological structures. A Collaboration between volcanologists and (astro-)particle physicists, Tomuvol, was formed in 2009 to study tomographic muon imaging of volcanos with high-resolution tracking detectors. Here we discuss preparatory work towards muon tomography as well as the first fux measurements taken at the Puy de Dome, an inactive lava dome volcano in the Massif Central. More can be found in this presentation.